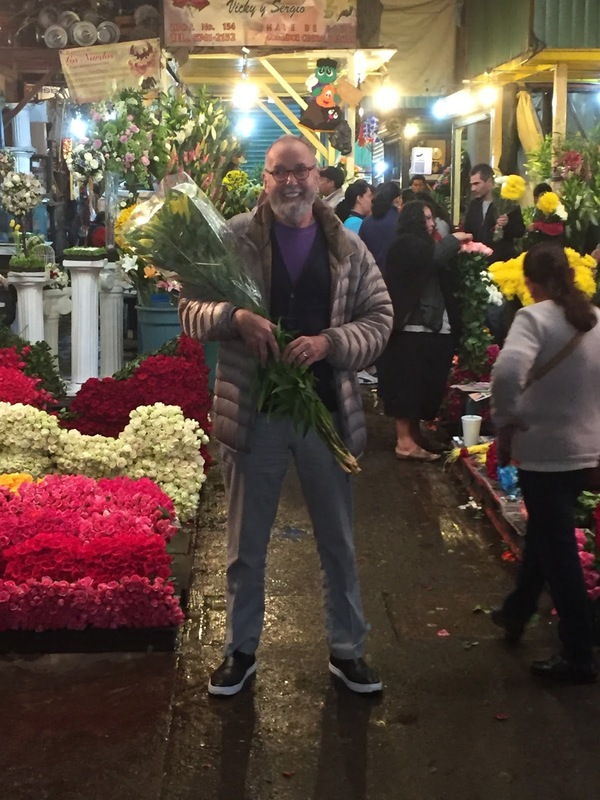 On my recent trip to Mexico City to present Fall ’16 trends and tour a newly opened luxury department store, I had a chance to visit the glorious, overwhelming, huge Jamaica Flower Market. 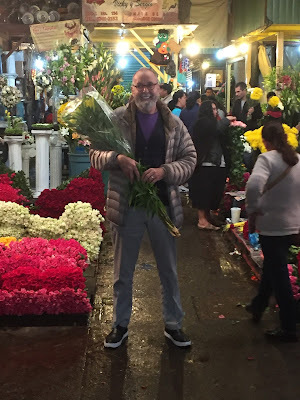 As an artist, I gravitate to color and I was left dazzled and dazed after walking through the explosive rainbow of colorful roses, lilies, birds of paradise, daisies and so much more. The combinations of color on display are artful and sometimes unexpected, always inspiring. Some of the vendors specialize in arrangements for weddings or funerals and because it was Christmas season, there were impressive, festive Holiday arrangements and wreaths. 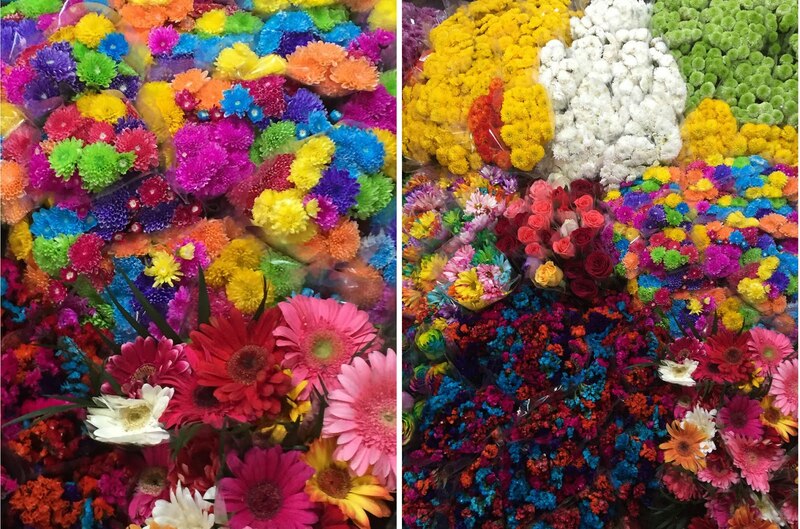 The flowers are sold wholesale and/or retail. Prices are ridiculously low. The Jamaica Market is open 24 hours a day, 365 days of the year. A new exhibition at The Museum at FIT (Fashion Institute of Technology) in New York City traces the history of the world’s most popular fabric…indigo blue denim. 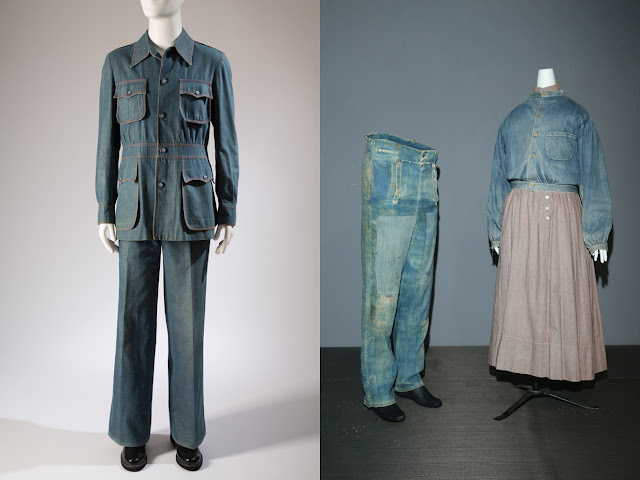 “Denim, Fashion’s Frontier” is a rather uninspired display that begins with a pair of work pants made in 1840 and tracks the textile right up to the current season. The presentation lacks excitement, dismally dark with only one bright spot, a TV monitor playing the notorious commercial with Brooke Shields purring that “Nothing comes between me and my Calvins.” Arranged chronologically, the hard-working fabric turns up as workwear, cowboy clothes, prison uniforms, sailor suits, ‘40s playwear, hippie arts & crafts and decades of cutting-edge designer creations. Denim, originally perceived as lower class, stepped up into big money importance in the 1970s. Designers like Calvin Klein launched “premium” denim lines, elevating the humble material into high fashion status. The curious, on-going phenomenon of wearing worn-out blue jeans is represented but not explained. In fact, the exhibition brochure/guide never bothers to explain that denim is a sturdy cotton warp-faced, diagonal ribbed twill textile. The warp threads are indigo-dyed, the weft left white which is why true denim is white on the inside. Denim was thought to be so-called because a wool blend textile was developed centuries ago in the French town of Nimes (“de Nimes” became “denim.”) But recent research disagrees. To add more historical confusion, there was also a cotton fabric called “Jean.” Experts now estimate that on any given day, half the world’s population is wearing blue denim jeans. Such a success story should be more excitingly told. The exhibition continues until May, 2016. 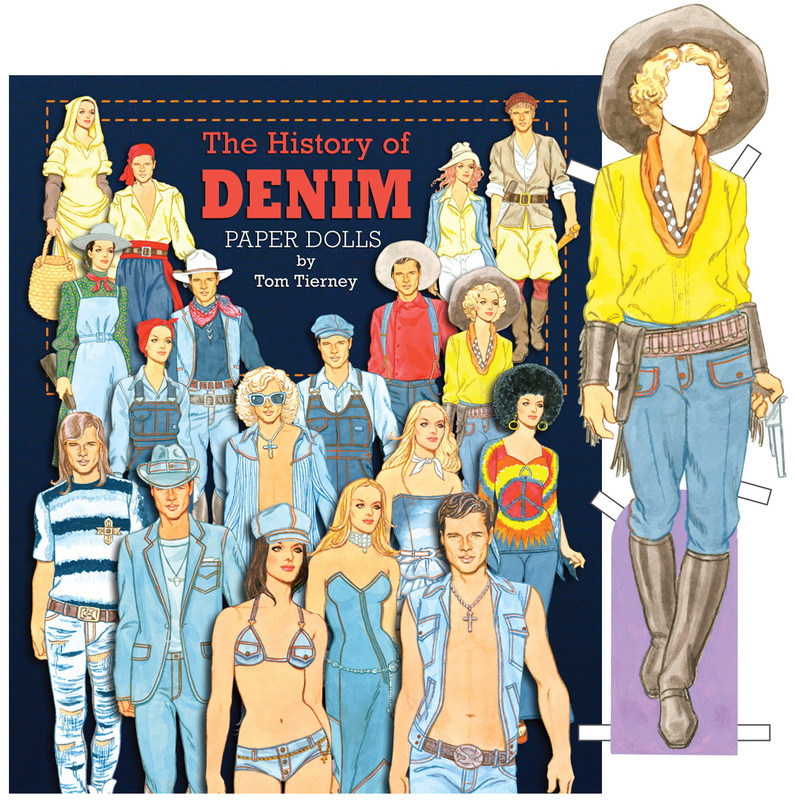 For more denim information, see the History of Denim, a well-researched paper doll book by the late Tom Tierney. It’s an excellent collector’s item available at paperdollreview.com and amazon.com. '40s jumpsuit, '73 Roberto Cavalli embroidery, '40s Popover dress. '73 leisure suit, 1840s workwear. '02 Junya Wantabe Gown, '90s Hip-Hop Style, '69 Decorated Jeans. There's a Goat Eating My Paper Doll Book! Linda Hoerner is one of today’s most creative and clever paper doll artists. She has a great sense of humor. I laughed out loud when I saw a page from her forthcoming More Paper Pals Paper Dolls. A very hungry goat is depicted nibbling on my own Polka Dot Paper Dolls book! Linda’s book is a delight and will be published by Paper Studio Press this summer 2016. 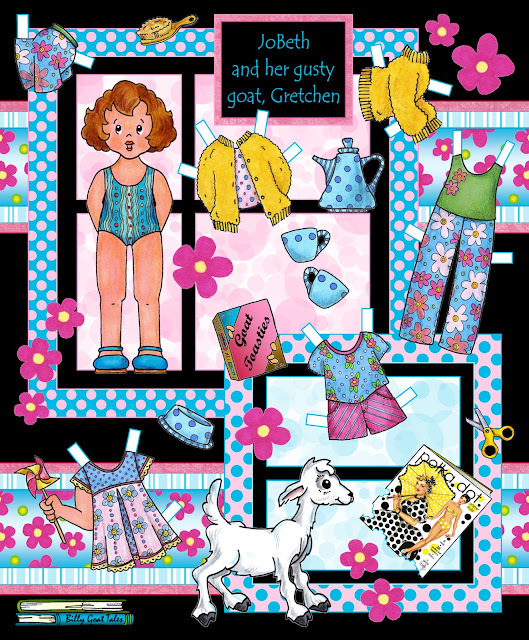 Gretchen the goat and the partially eaten paper doll book. By Linda Hoerner. 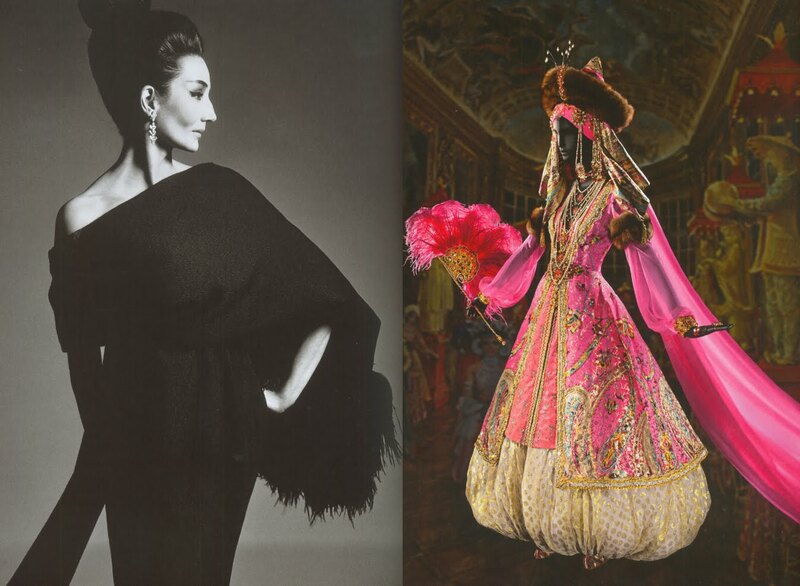 Jacqueline de Ribes at the Met, Elegance Personified! 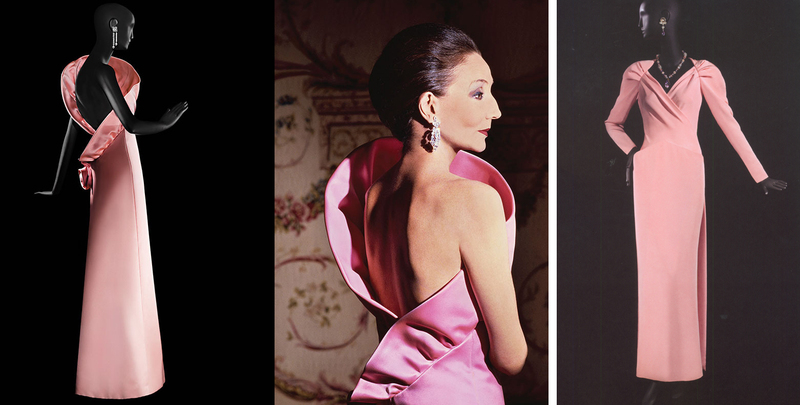 The new exhibition at NY’s Metropolitan Museum is an ode to an 86 year old French aristocrat, Jacqueline, the Countess de Ribes. She is an extraordinary beauty. Her distinctive profile was captured in many photos (the most famous by Richard Avedon). When Jet Set High Society set the stratospheric standards of fashion, Jaqueline de Ribes represented the height of high fashion, always absolutely on trend, although never actually setting a trend. That would have been considered too vulgar in the decades before Kardashian exhibitionism. The Countess was passionate about fashion and as a young woman made her own clothes before she became one of the preferred clients of the great Paris couturiers. Had she not been born into such a rigid social strata where women were not allowed to work, there is no doubt she would have been a successful fashion career woman. As it was, she worked in close collaboration with the designers who dressed her, customizing creations to make them uniquely hers. 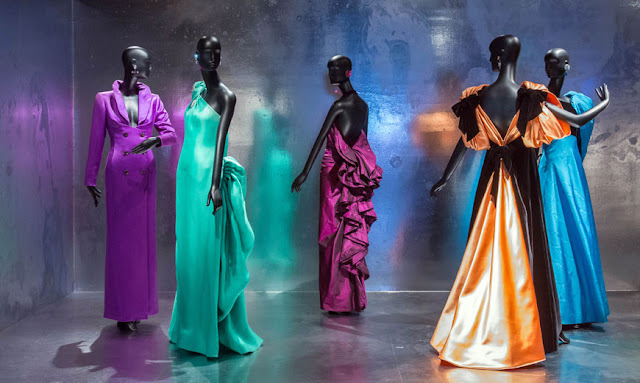 The exhibition at the Met displays a wardrobe of exquisite perfection and a strong sense of personal style, the most breathtaking items being costumes the Countess created for several history-making fancy dress balls. In the 1980s, she launched herself commercially as an haute couturier against her family’s wishes and enjoyed a successful, though somewhat brief career span. Her creations were never avant garde, but ever elegant. 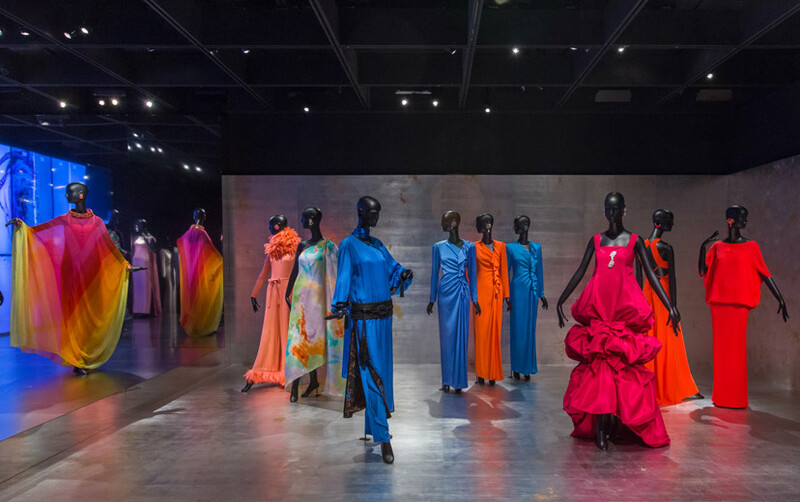 The exhibition at the Metropolitan Museum of Art in Manhattan ends February 21, 2016. I never met the elegant Countess though I saw her at fashion showings in Paris and appreciated her unique beauty and personal style that was so often idolized in Vogue and WWD. When I moved to London in the mid-60s, my very first freelance assignment was for The Evening Standard, England’s national newspaper. The fashion editor had written a story about the Countess purchasing a special gown but such publicity was considered vulgar then (How times have changed!) and no photo was available of the aristocratic Countess in the draped and jeweled gown. The editor was thrilled that I was so knowledgeable and could sketch the unique beauty of the Countess and accurately draw the dress. That sketch (No, I don’t have a copy of it!) got a lot of attention and helped to jumpstart my 20 year Euro-career as a fashion illustrator. Jacqueline de Ribes' famously unique profile. Elegant exhibition at the Met. Pink gowns designed by JDR. Yves Saint Laurent Gown, photo by Avedon, '62. Bal Oriental Fancy Dress, '69. 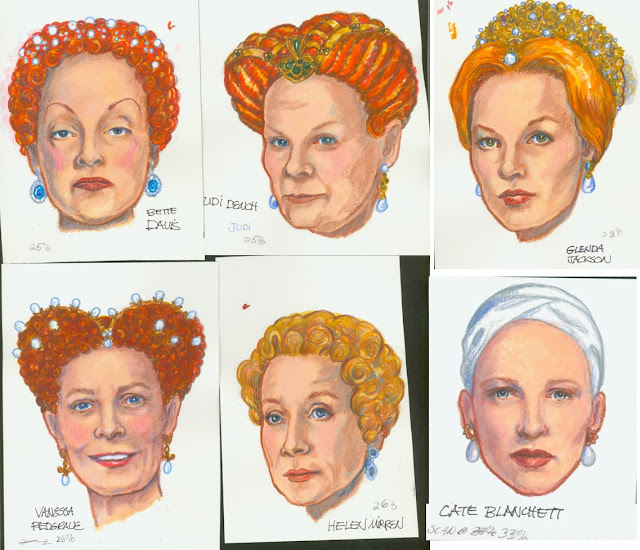 Queen Elizabeth on the Screen is my current work-in-progress paper doll project for Paper Studio Press. It will be the second in a new series entitled “David Wolfe’s History of Hollywood Costumes” and will feature dolls and costumes from movies and TV series portraying the great ruler. There will be six dolls representing famous actresses who played Queen Elizabeth: Bette Davis, Glenda Jackson, Helen Mirren, Cate Blanchett, Judi Dench and Vanessa Redgrave. Each doll will have several extravagant costumes. 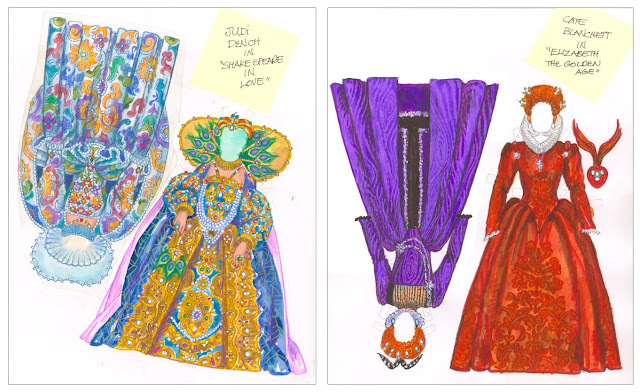 The Tudor Queen’s fashions are an artistic challenge for me, requiring careful research and then hours of painstaking drawing and painting the lavish fabrics and fantastic details like ruffs, feather fans, massive jewelry, yards of pearls and crowns. It is interesting to note how every screen version over the years reflects the prevailing fashion of the times. 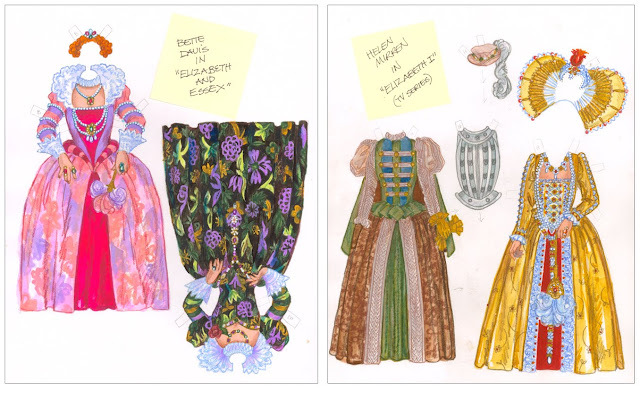 This new book with six dolls, ten pages of costumes and the stories behind the costumes will be published early in the year.